On Sunday 6th May 2012 a small group from local running club, Ripon Runners , set off to see how fast they could complete the Aislabie Walk. Their Chairman, retired GP Chris Bennett did a recce of the route previously. I was intrigued, so three weeks ago walked it with my son but stopping in Grewelthorpe for a pub lunch and refreshment. Including lunch, our time was about 8 hours. Even though this route is so near to Ripon, there were many sections I had never ventured on before, such as the valley and woodland route between Hackfall and Azerley. The Bluebells are almost at their pinnacle of Spring perfection so I suggest going soon but as a run of course! The following week he persuaded two other members to tackle the course with him. Last Sunday Paul Walker, Zak and I set off to do just that. At 3hrs 55mins it took longer than we’d expected but throwing the unfortunate dog over gates and stiles (plenty of these) along with map reading took up many minutes. Off-road shoes are recommended as there is abundant mud, especially in Hackfall. So for anyone interested in taking on this challenge at speed there’s your target. 3 Hours 55 minutes. If you beat it please do let me know the details. 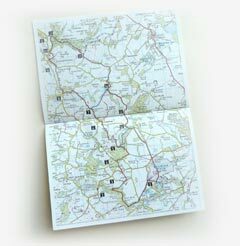 A map of the route together with a detailed description written by Mark Reid is available to download in .pdf format.